This past spring, Baku's Institute of Manuscripts celebrated the 100th Jubilee of its unique building. Originally, this structure housed the Alexandrian Russian Muslim Female Boarding School, the first girls' school in the Muslim East, built by oil baron and philanthropist Haji Zeynalabdin Taghiyev (1823-1924) at the turn of the 20th century. Ever since 1950, this former school has been used to house the Institute of Manuscripts and its collection of rare medieval Eastern texts. The Institute currently archives about 40,000 works in languages that include Azeri, Turkish, Uzbek, Persian and Arabic. These texts reveal what Azerbaijanis from the Middle Ages thought about medicine, astronomy, mathematics, poetry, philosophy, law, history and geography. In addition, the Institute of Manuscripts houses many valuable documents from the private collections of famous Azerbaijanis in its Department of Private Funds. In many cases, families have donated entire collections of unpublished papers and letters to the Institute, where these documents are then kept, investigated and published. Artifacts include diaries, memoirs, photos and documents from the 19th century and early 20th century. 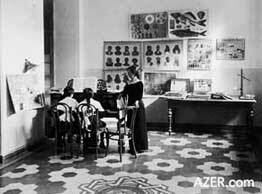 Photos: The building that now houses Baku's Institute of Manuscripts was originally built as the first girls' school in the Muslim East by Oil Baron Philanthropist Haji Zeynalabdin Taghiyev (1823-1924). Taghiyev was convinced that if you could educate women, you would educate your entire population. Some of these girls became the mothers of prominent contributors in Azerbaijan. 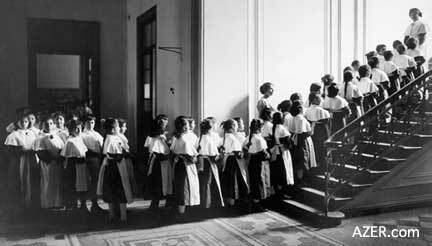 The school, which was called the Alexandrian Russian Muslim Female Boarding School, was designed by Polish architect Joseph Goslavski and was under construction from 1898-1901. The school operated for nearly 18 years. 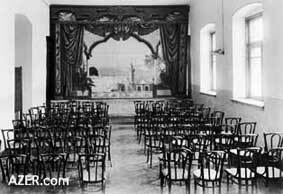 Despite the fact that the Bolsheviks confiscated all of Taghiyev's property, his personal album of photos still exists within the family and are published here courtesy of Saida Mirizade. 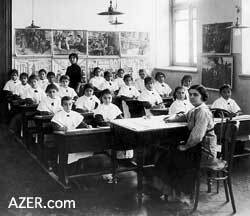 Classes not only provided basic education but gave girls the opportunity to learn music and drama as well. 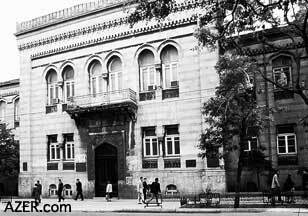 For instance, the Institute archives the private funds of (1) composer Uzeyir Hajibeyov (1885-1948); (2) writer and philologist Yusif Vazir Chaminzaminly (1887-1943); (3) journalist Ali Abbas Muznib (1883-1938), a researcher of Azeri literature and an editor of satiric magazines; (4) writer Abbas Sahhat (1905-1973), a researcher of Azeri literature; (5) 19th-century writer/historian Abbas Gulu Agha Bakikhanov, author of the first European-style book on Azerbaijani history; (6) Mirza Fatali Akhundov (1812-1878), a writer, reformer and playwright; (7) Ali Agha Shikhlinski (1863-1944), an important military strategist, general and inventor; (8) Mirza Kazimbey (1802-1870), a scholar and linguist; (9) Mikayil Mushfig (1908-1939), a dissident poet who was killed during Stalin's Repression (see article in this issue); (10) distinguished Azeri actor Huseingulu Rezayev (1879-1945), who was known by the stage name "Sarabski" and played the first Majnun in Hajibeyov's 1908 opera "Leyli and Majnun" (see article in this issue); (11) and Mursal Najafov, who left a memoir of his friend, artist Sattar Bahlulzade (1909-1974). There are numerous others as well. The Institute also houses the letters, diaries, scores and librettos of Azerbaijani composer Muslim Magomayev (1885-1937), including valuable information about his collaboration with composer Uzeyir Hajibeyov. One of these librettos is that of the "Shah Ismayil" opera written by Magomayev in 1916.